This is going to seem like the simplest advice you’ve ever read, but if every therapist were actually implementing it, I wouldn’t think it was important to write about. 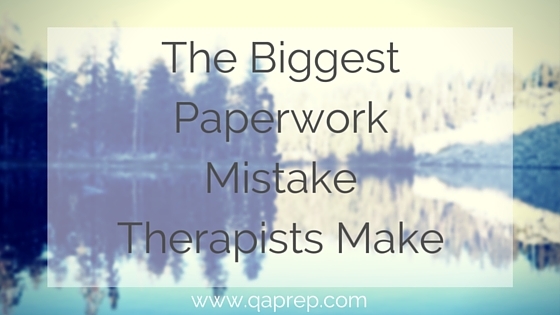 The biggest paperwork mistake therapists make is not writing things down. When writing notes on your sessions and interactions, keep the information really basic, simple, and elaborate whenever you have that “gut” feeling that something was off. This could be a phrase that struck you as odd or out of the norm for your client, even if it wasn’t a clear threat. It could also be something more glaring, like a client’s passive suicidal ideation and any steps you took to ensuring your client is safe. Another important thing to document (that is sooooo often missed) is things outside of session. A family member calls and leaves you a message about the client’s recent behavior. The client calls you two days after your last session to say “I’m wondering if this is really working out.” A social worker contacts you about a child client you’re seeing because a child abuse report was made by the school. None of these are things that happened during your session, but they are all just as important to document. Make sure you are clear about basic things like dates, times and names of who you interacted with but also about why you’re doing what you’re doing. If you’re presented with a grey area, consult with a trusted colleague and write a note explaining your reasoning behind your actions. Ultimately, you are much more likely to regret a lack of documentation than over-documenting. If you take away anything from this article, or from anything I say ever, take away this: If it’s not written down, it didn’t happen! Seriously, post it next to your computer or notepad as a constant reminder so your actions are never called into question. And for those sticky situations where you feel you really need help and don't know what to do, schedule a consultation or check out the resources available on the QA Prep website. Happy writing, everyone!